Are you the person that looks so good that people start taking pictures of you even if they don’t know you? Maybe you do and maybe you know someone that this happens to. This t-shirt will help you to get ride of those nasty photographers taking pictures of you. 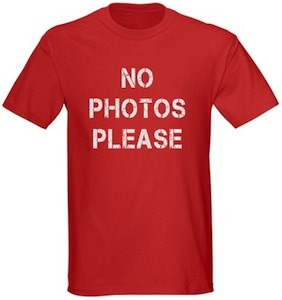 The shirt design is simple it just says in big letters “No Photos Please” and the shirt comes in a range of colors, styles and sizes so that you can get one for everyday of the week. Of course they make a great fun gift for someone that thinks that they looks so good.